London Continental Railways (LCR) and Union Railways North (UCN) required the design, development, installation and commissioning of an entire Station Control System (SCS) as part of the CORBER consortium supplying to London’s St Pancras International high speed rail terminal. 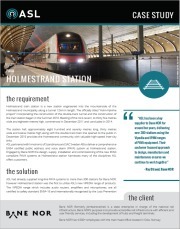 The £1.2m contract included the required integration of over 8,000 field devices across 16 subsystems including CCTV, BMS, network switches, Passenger Help Points, ASL-supplied Long Line Public Address and Voice Alarm, Access Control, Passenger Information Systems (PIS), vehicle barriers and PABX. ASL’s solution was iVENCS - an intuitive 3D control system, designed and developed over a 4-year R&D programme, complying with TickIt ISO 9000- 3 software quality practices and procedures, providing an alternative to the existing SCADA-based systems in the market. iVENCS’ advanced features allows for tiered user role operation across multiple sites, fail-over and redundancy between operational and backup locations, monitoring and control of all safety subsystems from a number of synchronised workstations, situated in the Eurostar control rooms amongst others located about the station. iVENCS uses open source technologies, enabling long term development and support of the iVENCS platform without vendor lock-in. Following successful delivery against strict time and budget constraints, ASL won a number of awards including ‘Best AV/IT Project’ and ‘Systems Product of the Year 2008’. Since the project, ASL have been providing support with the maintenance of the site, with daily remote health checks along with a support and maintenance strategy aimed at reducing overall lifecycle costs. The result has led iVENCS to achieve the highest availability figure out of all systems at St Pancras. The iVENCS Control System is an open and intuitive integrated management platform. Offering robust control, monitoring, and incident analysis across all building safety, security and communications subsystems, iVENCS sits at the heart of building and site management. The MPS range of paging microphones provide live, store-and-forward, and recorded message broadcast into user selected zones. If required, they can also be configured to provide EN54-compliant emergency functions and all EN54 mandatory indicators and controls. VIPEDIA-12 technology combines over 20 years of voice alarm experience, and forms the heart of the ASL’s VIPEDIA rack-based EN54 solution. It takes care of every part of the system, from the monitoring of the loudspeakers and microphones, to the routing of messages to many zones simultaneously. 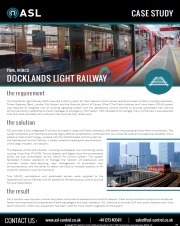 A case study on ASL's work with Docklands Light Railway. 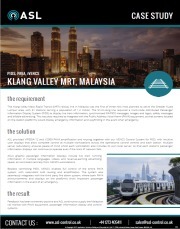 A case study on ASL's work on Klang Valley MRT, Malaysia. 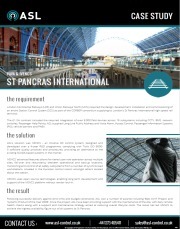 A case study on ASL's work with St Pancras station. 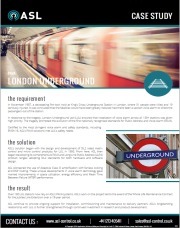 Case Study on ASL's work with London Underground. An overview of the company and ASL's PAVA products. An overview of the iVENCS Public Address module. An overview of the iVENCS Passenger Information Systems module. An overview of the iVENCS SCADA module. An overview of the iVENCS Network Monitoring module. An overview of the iVENCS Display Systems module. An overview of the iVENCS CCTV module. An overview of the iVENCS Fire module. An overview of the iVENCS Core package.